Today I’m participating in Georgie’s monthly link-up “A Day in My Life” – be sure to join, I’m always curious about how other people spend their day! It was relaxing and was great to spend some time away from work. Sometimes I really need those “stay at home” days. Getting ready for outings always takes time for me. Surprisingly, it’s not because of makeup but more about choosing what to wear. 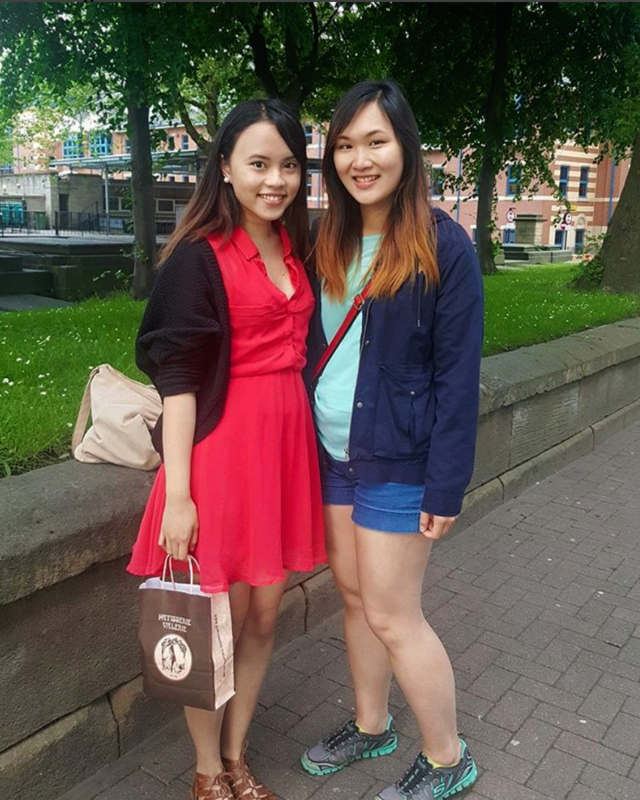 After rummaging through my sister’s wardrobe (after deciding I had nothing to wear from mine), I picked up a red dress I gave to her but she never wore. So later in the evening, I went out to dinner with my university friends before one of them goes away for an industrial placement. I felt like a proud mother on what she’s achieved so far – I love having such motivating and inspiring friends around that really drive me towards my own goals. 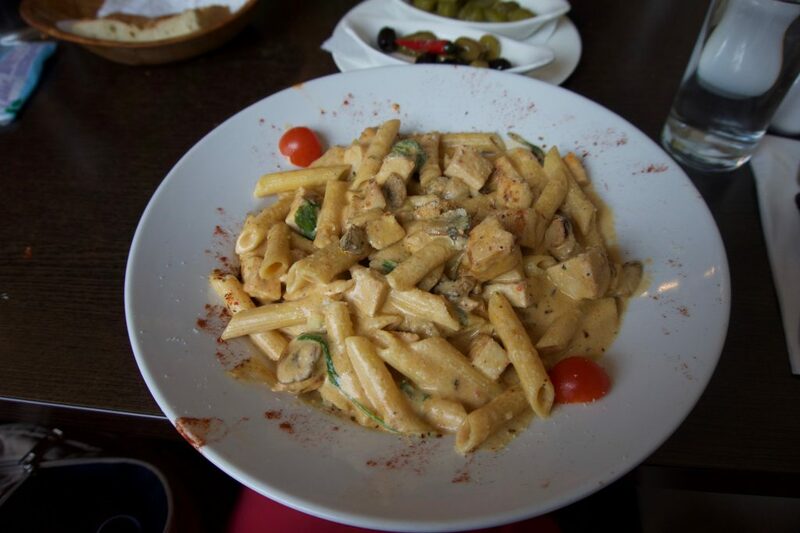 I had the chicken and mushroom pasta – I commented on how big the portions are. Usually, restaurants give out ridiculously tiny portions that I never leave full but today, I left full and actually very bloated! One of my friends couldn’t even finish hers and had to ask for it to be wrapped away. This is probably the second time I’ve seen someone ask for food from restaurants to be packaged away for later, I didn’t know you could do this until recently. But when do I get to pack stuff away especially when I eat at places with small portions, ey? 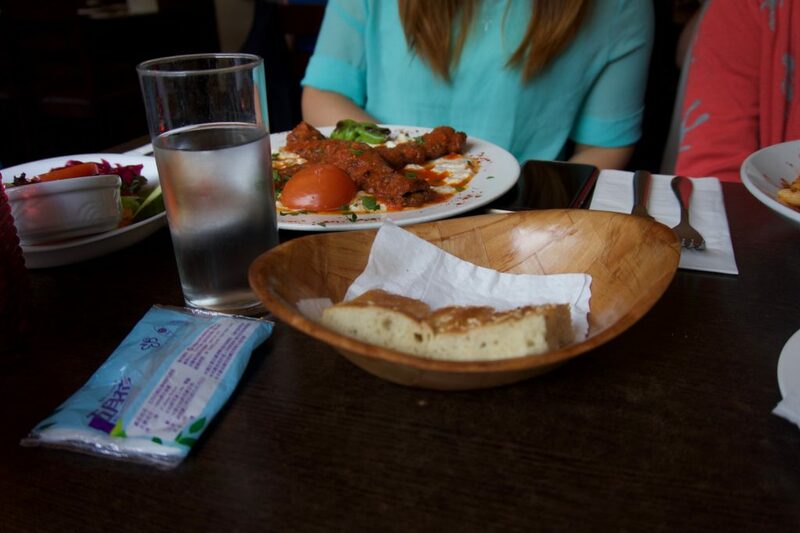 And the best part… all for only £8.50! Other places like Zizis would charge pasta that only takes up 30% of the plate for £12 so I’m really happy to have stumbled upon this Mediterranean restaurant. Once we left, we found out that there was a 10% student discount. It’s only 10% but still something, we all decided to always check before going in or asking for the bill. Overall today was fun and relaxing. I think the summer feeling has finally kicked in. I enjoyed the company I had, I even received a cute early birthday gift (birthday on Friday!) from my friend. As always so incredibly thankful for the gesture. Now I should try and get some sleep for an extremely long shift at work tomorrow, which I strangely look forward to. Awww so sweet:) I love to look at your post! Aww, thanks again for stopping by to read it. I had so much fun, I can’t wait to see you again next week! Keep making me proud ?? Relaxing days are great and very needed sometimes 🙂 I have a long to-watch list that I really need to spend time on. Monster’s University used to be on it, but I crossed that one off last year! Good movie! Yum, all of that food looks delicious. I love pasta. A lot of restaurants here have large portions, and I should ask to box some of it up… but I end up eating it all and being really full instead, haha. That’s nice that there was a student discount! That sounds like it was a great day! Student discount would be so handy! Monster’s University was an awesome movie! It’s nice to see what happens to these animated characters “growing up” with you; like Finding Dory! Haha, must not be america then. 🙂 Gawd, I hardly go out to eat because they always serve so much and I hate to waste food. I’m always getting the ‘to-go’ box at the end of the meal. That pasta dish caught my attention right away. I currently love pasta and that is a ridiculously nice quantity. I had a pasta dish last night and I experimented with Indian flavours in pasta and the result was quite good! I haven’t watched Monster’s University completely. I usually end up watching just the ending! I’m doing a post for a day in the life myself in Georgie’s Linkup! I’m surprised you didn’t know that you could take away food you haven’t finished! It is pretty common here in Australia, and sometimes the waiters and waitresses even ask you if you want to take it away. In my experience a lot of less-fancy restaurants give our massive portions that really fill me up. As a result I don’t want any dessert. ? Fancier restaurants tend to have smaller portions because they want you to order entrees and dessert too.